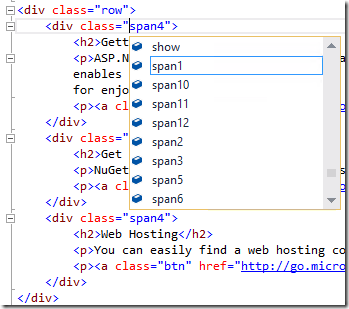 Microsoft provides the new features of the ASP.NET and Web Tools for Visual Studio 2013 RC. Click here to download and install the Visual Studio 2013 RC today. Please check for release notes, documentation, and tutorials. This post includes both the new RC features and the features that already announced in the ASP.NET and Web Tools for VS 2013. Visual Studio team made a simple UI for creating projects that offer support for multiple ASP.NET frameworks (Web Forms, MVC, and Web API). New features are available for Web Forms that used to be offered only for MVC, such as automatic test project creation different authentication configurations. Different authentication configurations can be chosen, and authentication works the same in all ASP.NET frameworks and in web hosting software other than IIS. 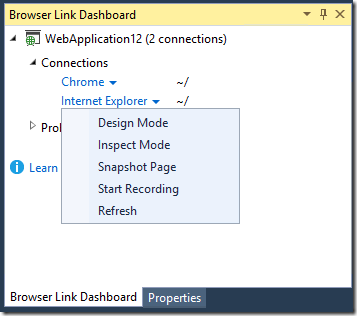 For more information about the new process for creating web projects, see Creating ASP.NET Web Projects in Visual Studio 2013 RC. Team also released API to write browser link extensions. Mads’ web essentials for Visual Studio 2013 (source) contains a few extensions that one can find really useful. In the Browser Link Dashboard, you can see each active connection listed under the Connections node. You can use the down arrow for each browser to choose a task, such as refresh each individual browser manually, or manual actions with the extensions that you’ve installed, such as “Design Mode”, “Inspect Mode”, “Snapshot Page”, “Start Recording” web essential extension commands. The Problems node lists the possible reasons why the browser link might not work and offers suggestions to correct the problem. 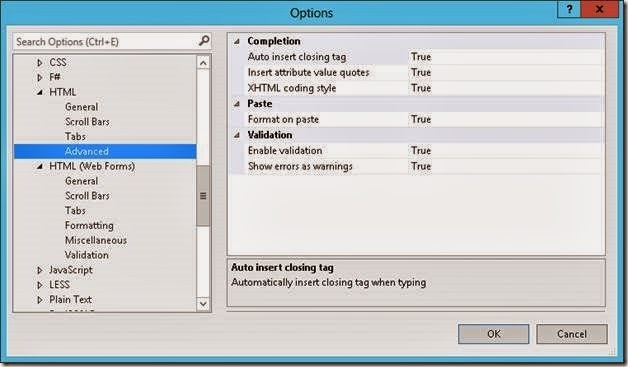 In VS2013 RC, a new HTML editor is released for Razor files and HTML files. Web Forms .aspx, .master and user control .ascx files are still using the legacy editor for various reasons. The new HTML editor provides a single unified HTML5-based schema. It has some improvement such as automatic brace completion, jQueryUI and AngularJS attribute IntelliSense, attribute IntelliSense Grouping etc. In RC, team makes CSS class attribute intelliSense working even if bundling and minification is used. 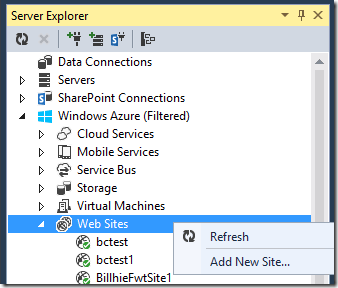 With installation of Azure SDK 2.1, you can create Windows Azure web sites from VS2013 RC’s server explorer. You can easily configure the website, add a new Web Site, and import the subscription file (which is used to publish to Windows Azure from the Visual Studio). 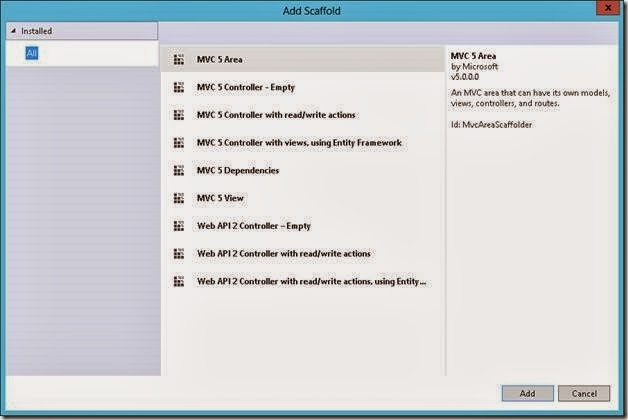 VS 2013 RC has completely rewritten MVC Scaffolding. Please visit here for more information. team removed WebForm Scaffolding from this release because it's not ready yet. We’ll put the new bits in future release, possibly targeting update 1. MVC projects are now standard Web Applications and do not use their own project GUID. 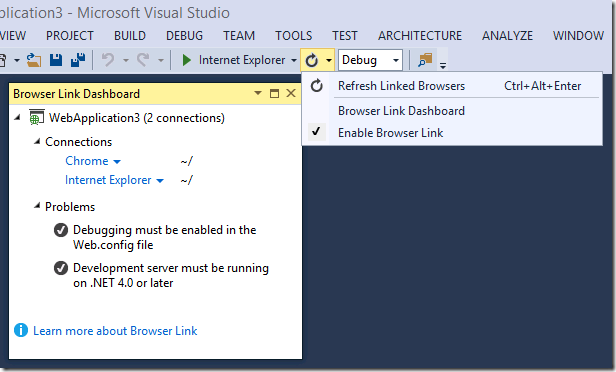 An MVC 5 project is created if the MVC checkbox is checked in the One ASP.NET new project dialog. For more information see Getting Started with ASP.NET MVC 5. For details on ASP.NET Web API 2 features, please see the RC release notes or refer to the ASP.NET Web API 2 documentation here. SignalR 2.0.0-rc1 is included with VS2013 RC. It includes support for MonoTouch and MonoDroid, portable .NET client, and the self-hosting package Microsoft.AspNet.SignalR.SelfHost, and it is backwards compatible for servers. For more SignalR 2.0.0-rc1 release notes, please visit. Entity Framework 6.0.0-rc1 is included with VS2013 RC. See for detail. The Microsoft OWIN components (also known as the Katana project) integrates support for the Open Web Interface for .NET (OWIN), deep into ASP.NET. OWIN defines a standard interface between .NET web servers and web applications. Any OWIN based application or middleware can run on any OWIN capable host, including ASP.NET on IIS. You host OWIN-based middleware and frameworks in ASP.NET using the Microsoft.Owin.Host.System Web NuGet package. 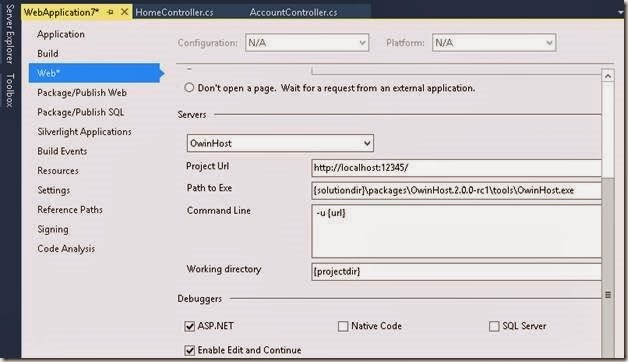 The Microsoft.Owin.Host.System Web package has been enhanced to enable an OWIN middleware developer to provide hints to the System Web server if the middleware needs to be called during a specific ASP.NET pipeline stage (ex during the authentication stage). The Microsoft OWIN Components also includes an HttpListener-based server, a self-host API and an OwinHost executable for running OWIN applications without having to create a custom host. With the OwinHost 2.0.0-rc1 NuGet package, VS2012 RC can now easily convert an IIS Express based WebAPI or SignalR project to a project that is run from OwinHost.exe. ASP.NET authentication is now based on OWIN middleware that can be used on any OWIN-based host. Microsoft OWIN Components includes a rich set of middleware components for authentication including support for cookie-based authentication, logins using external identity providers (like Microsoft Accounts, Facebook, Google, Twitter), and logins using organizational accounts from your on-premise Active Directory or Windows Azure Active Directory. Also included is support for OAuth 2.0, JWT and CORS. For more information see An Overview of Project Katana. ASP.NET Identity is the new membership system for building ASP.NET applications. 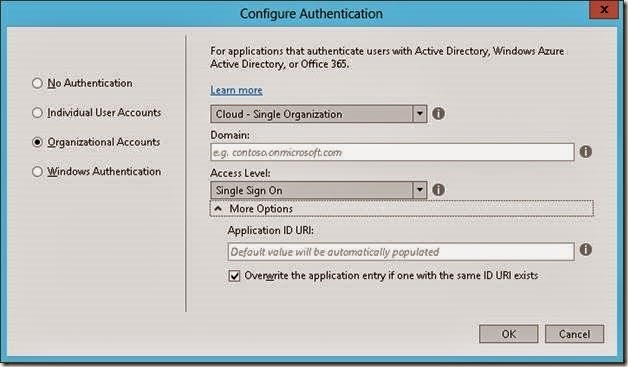 ASP.NET Identity makes it easy to integrate user specific profile data with the application data. 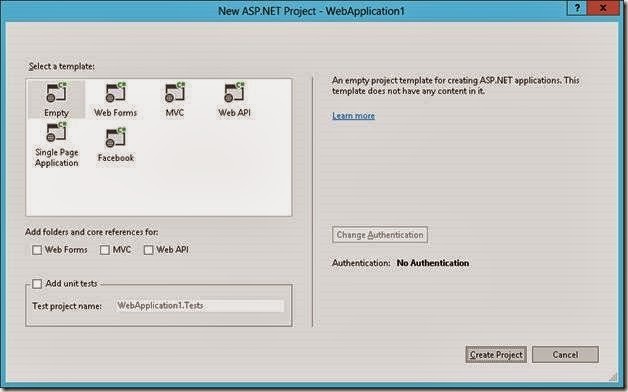 With ASP.NET Identity you control the persistence model of your application. For example, you can store your user data in a SQL Server database or any other persistence store. For information about using ASP.NET Identity with Individual User Accounts authentication, see. NuGet 2.7 is included with VS2013 RC. See. Good Information, I want to develop my site with asp.net and your article very helpful :) Are you use Azure for your asp.net hosting? Can you tell me, your experience about azure? Nice info!!!! Glad to share this in my blog .It has some information that I really need in my project for better enhancement.Azure with asp.net hosting makes it more scalable from other hosting .I think asp.net hosting is the best hosting sites which are more compatible and user friendly than others.